It is hard to imagine anything more breathtaking, or fragrant, than fourteen acres of blooming roses! This magnificent scene greets visitors each April and October at the Tyler Municipal Rose Garden, the country’s largest public collection of roses with 38,000 bushes of at least 600 varieties. 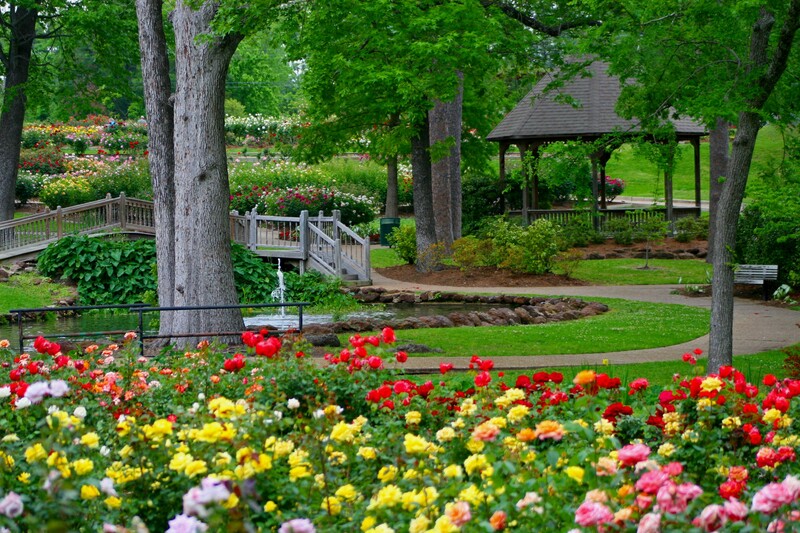 Because of its spectacular public garden, as well as its large rose-growing industry, the City of Tyler has adapted the nickname, “The Rose Capital of the World.” Throughout the year, the Tyler Rose Garden is filled with visitors and is a popular and picturesque setting for weddings and parties, offering a lush backdrop for photographic opportunities of all kinds. It is a “must-see” for any avid gardener and was listed in 2011 in Liveability.com’s Top 10 Most Inspiring Gardens in the USA. The one-acre Heritage and Sensory Garden was established in the 1980s and features 30 varieties of antique rose bushes that date back as far as 1867. Along the north boundary of the garden is one of only 24 trial sites in the United States for growing new rose cultivars that are under consideration for adoption through the All American Rose Selection. These experimental varieties are judged for two years before a decision can be reached for final selection. While visiting the trial site garden, visitors should take note of the two handsome fountains (circa 1912) that were moved from the Smith County Court House when it was demolished in 1951. The unique IDEA Garden (Innovate, Demonstrate, Educate, and Apply) was created in 1999 by the City of Tyler and the Smith County Master Gardeners “to test and display underused varieties that have potential for East Texas landscapes.” The planting also demonstrates the latest earth-friendly growing techniques and principles. The David Austin English Rose Garden, established in 2003, contains 22 varieties and more than 200 samples of roses bred by well-known English rose cultivator David Austin. The Shade Garden trial area in the southern portion of the garden was created in 1997 to identify and test new varieties of plants that are well adapted to shady sites. Highlights of this planting area are 25 varieties of Japanese maple trees. According to the Texas Historical Commission, about half of all of the rose bushes produced in the United States come from the Tyler area. The rose industry is vital to the region’s economy, and thousands of rose bushes and flowers are shipped all over the world every day. The history of the industry began in the late 1800s when farming became established as a major activity in Smith County in northeast Texas. The farmers’ first crops were the omnipresent cotton and corn, but they soon began to branch out to fruit orchards and, beginning in the 1870s, to experiment with growing rose bushes. By the turn of the century, Smith County had more than a million fruit trees, primarily peach. Unfortunately, drought, hard winters, and peach blight destroyed much of the fruit industry over the next decade. Many farmers turned to the more dependable rose bush propagation that seemed to better suit the soil and weather of the Tyler area. A combination of sandy soil, year-round rainfall, and a long growing season seemed ideal for that purpose. Over the next few decades, the industry grew rapidly, and by the 1940s, more than half of the nation’s supply of rose bushes were grown in the Tyler area. Over the years, the industry has had its expected ups and downs in Smith County, but rose growing and processing is still synonymous with the City of Tyler. The land that became the world famous Tyler Municipal Rose Garden was purchased in 1912 with the intention of constructing a new park and fairgrounds. After years of inactivity, the president of the American Rose Society urged the city to apply to the federal Works Project Administration (WPA) to fund the construction of a municipal rose garden on the site. The WPA agreed to the request and awarded a $181,255 grant to the City of Tyler to construct a stone picnic pavilion, balcony, stairs, and other garden features. It is thought to be the largest municipal park and garden project approved by the WPA. Architect Keith Maxwell (also with the WPA) drew up the initial plans for the garden, but later, they were revised by local nurseryman Henry Thompson who laid out the existing beds and walkways. Thompson was killed in World War II, and the garden was later dedicated to his memory. The Tyler Municipal Rose Garden was officially opened in 1952 with the original 3,000 rose bushes donated by local nurseries as a “living catalogue” of their wares. The highly anticipated Texas Rose Festival has been conducted each year since 1933 by a volunteer-based organization that “promotes pride of Tyler and Smith County and the rose growers industry.” Rich in tradition, the Texas Rose Festival is held annually during the third week of October and features many elaborate rose-themed events such as the Rose Parade with custom floats, marching bands, and dignitaries; the Rose Show with thousands of blooms; the Queen’s Coronation; the festive Queen’s Tea. The Tyler Municipal Rose Garden is located at West Front Street, Texas Highway 31, just west of downtown Tyler. It is open from dawn until dark, seven days a week, and admission is free. Every season brings great beauty to the garden; however, the roses come into their full bloom and glory every mid-April and mid-October. For more information on specific dates and times, call 903-531-1212 or visit www.cityoftylerrosegarden.com. Note: If you plan to visit the Tyler Municipal Rose Garden in July or August, be sure to also take in a performance at the wonderful Shakespeare Festival held nearby at Kilgore College. For times and prices visit the Texas Shakespeare Festival website at www.texasshakespeare.com.